Lewisham Council has begun the consultation on the pools redevelopment and are presenting three options for your consideration. 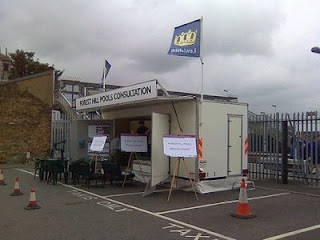 To take part in the consultation go to the Council website. Please take a look at the different layouts proposed for the three options and complete the feedback form at the end. It is very important that pool users and local residents have their say in this important site in Forest Hill town centre. How many pools do you want? What other leisure facilities do you want and is there enough room? Is the mass and height of the buildings right for the site? What is your opinion of the design of the building? How might it be improved? Does the proposal include the right amount of residential property? Is there the right amount of public space in the area? As well as taking part in the consultation we would encourage you to express your views on se23.com.